"Walk With Me, and I'll Take You Back Ten Thousand Years"
Imagine immersing yourself in a lake-studded wilderness, following a well-marked trail through a still, forested landscape. The tree canopy glows with sunlight, the sky-blue lakes sparkle with diamonds, the winding ridges offer quiet "rooms" to visit one-by-one, and all around the birds and other critters busy themselves. A timely bench offers a respite from the rather steep climb, and gives you time to reflect. 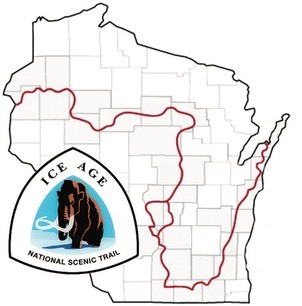 You are on the Ice Age National Scenic Trail. Twenty one miles of wilderness trail passes through Chippewa County. You wonder, how did this beautiful trail get here. Who cares for it? The Ice Age Trail is the result of countless hours of planning, designing, building, maintaining, and supporting by people just like you working over nearly the past half century. Organized as the Ice Age Trail Alliance, they work through local volunteer "chapters". In Chippewa County, the Chippewa Moraine Chapter was organized in the early 1970's as the trail was beginning to be built. Explore our Chippewa Moraine Chapter website to learn more about the Ice Age Trail and the many volunteers who build, maintain, and support the trail in Chippewa County. Follow the tabs along the top of the page to start, or start by clicking here to see what's new.